Communications is dramatically changing right now, as “mobility” and “IP” technologies such as LTE, Advanced LTE, WiMax, 3G, and Broadband Internet, lead this transformation. As these technologies are rolled out, basic voice/video/data quality will ultimately determine the fate of carriers and end equipment manufacturers. 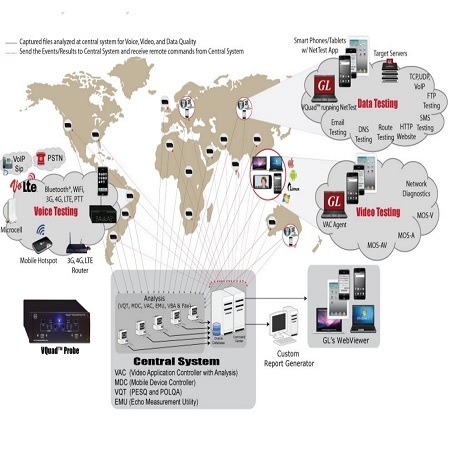 Simple and effective methods of testing voice, video, and data are sorely needed - GL’s Voice, Video, and Data Quality Test Solution provides this flexibility of connecting to and between any network, any service, and any interface. VQuad™ - Dual UTA, or the all-in-one VQuad™ Probe forms the central point of control for performing automated tests for voice, data, and video to and from Wireless devices (WiFi, Bluetooth®, 3G, 4G, LTE), Broadband Internet (3G, 4G), VoIP devices, PSTN, and TDM circuits assessing performance, quality and reliability of practically any network. Variousassociated applications (Voice Quality, Video Quality, Data tests, Echo and Delay tests, Fax tests, VBA) works with VQuad™ to provide "end-to-end assessment" with additional test and measuring capabilities. All the applications work in conjunction with the VQuad™ for automatically and remotely analysing the captured data and sending the test results to the central database. You can query results remotely or control the tests using web-based WebViewer™. Further, VQuad™ scripting provides for automation, mobility, remote accessibility, along with centralized analysis and data retrieval, which are just a few attributes of GL’s next generation Voice, Video, and Data Testing solution.